Well, we couldn’t let the food shows go by without addressing sushi, could we? So, here you’ll find our take on the world of raw fish (and other things) on top of vinegared rice. In all of our shared languages it’s sushi…no? 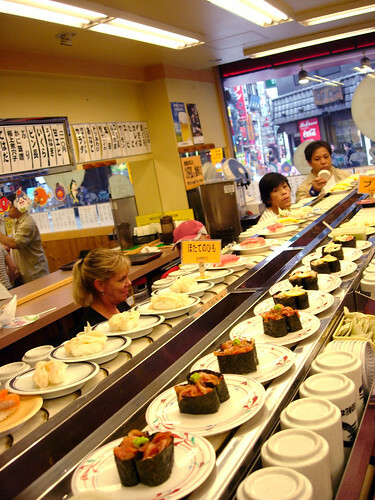 where do you go to eat sushi – regular restaurant or a real sushi bar? Next show we continue with our food theme, exploring chopsticks. Hey guys! I’m a first time listener who found you through Loco’s blog. Specifically the post about the recent Japan Writers Conference. I enjoyed your conversation about sushi, sashimi and onigiri but felt compelled to leave a “well actually” regarding nori. I found this relatively succinct wikipedia article about what nori is. Take a look! Yikes! Thank you Matsuuchi-san! You’re absolutely right about the nori, sorry about that.